Bribe. Good behavior = special treats such as extra stories, more cuddle time, an occasional short TV show, or game time. Use sparingly. Institute Mommy (or Daddy) Time-Outs. No more patience? Declare a “mommy (or daddy) time out” and go to a quiet(er) place for 10 minutes. Change the routine. I love routine so this is my last resort. Give them a project. The messier the better (see bullet number 1). 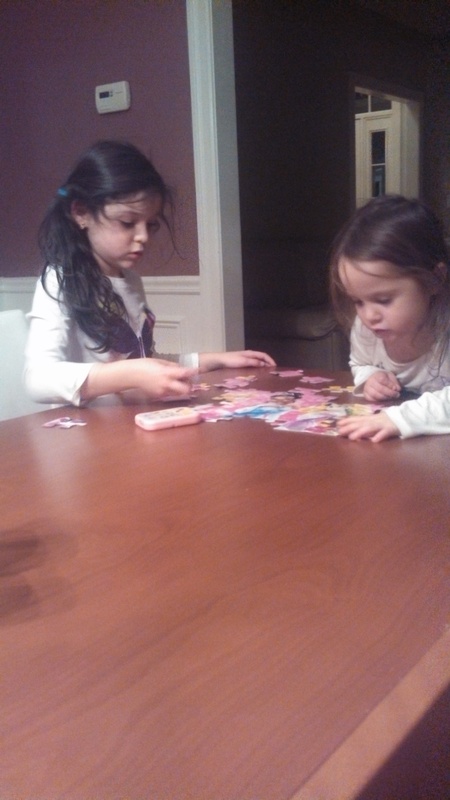 My kids working on a puzzle, leaving me alone while I cook dinner. 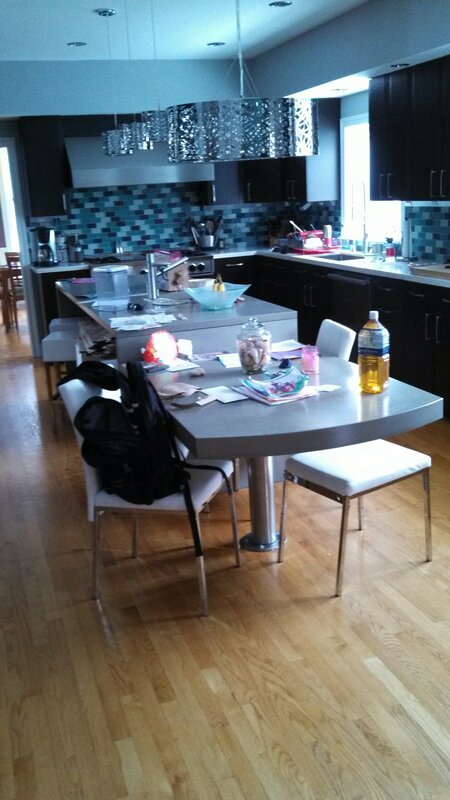 My kitchen any given Thursday that my hubby is traveling. Happy kids and a messy kitchen. I can live with that. Of course there are days with teary-eyed kids throwing themselves on the ground in rage despite all of my best efforts? And for that I have temper tantrum busters. And chocolate. My kids are tuned into all my strategies. Share yours so I can add to my repertoire. Like this blog? Follow me on twitter. This entry was tagged alone with munchkins, jill shaul, messy kids are happy kids. uhh…and she’s the co-winemaker at Signal Ridge, wine director at the Boonville Hotel, and future sous-chef there as well. And don’t forget the animal husbandry! She is??? I can’t keep up with her awesomeness. That’s great. My only comment is the occasional short tv show? What about a long one, two,three, or four tv shows? I know yours are not home all week but ones who are home it’s a necessity! I’m sure that if my kids were home all the time with me there would be a lot more tv watching for all of us. Evidenced by the increase of viewing on the weekend and snow days. I was always a big fan of the mommy time-out when my kids were young. Sometimes we need it more than they do! The girls think mommy time outs are hysterical.